With many of us drawing inspiration from the recent TV programmes focusing on creative crafts, we’re now on the cusp of a major sewing revival in the UK! For readers hoping to make a start on their own creative projects – from bespoke Summer fashion creations to soft furnishings for the home – we’ve called on Wendy Gardiner, senior sewing specialist at Simplicity the sewing pattern people to pass on some helpful tips on how to get crafty. When selecting a sewing pattern for your project, choose an easy-sew one to begin with and choose something that you would really like to make and enjoy wearing or displaying in your home. Look beyond the fabric and colour choices on the pattern packet – remember, this is your creation so it’s good to choose an easy make classic pattern and bring it right up to date with the latest colours and fabrics. 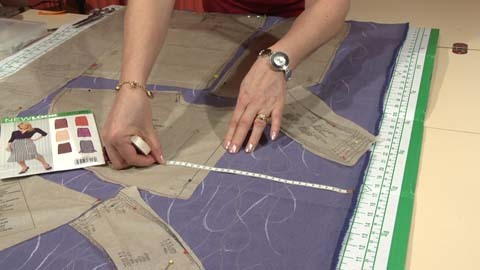 Always make sure that you use the right size – check your measurements against the pattern envelope. You will probably NOT be the same size as an off the peg garment from the High Street. Remember, with multi-size patterns you can easily and quickly cut from a small waist to bigger bust or hip – that’s a major plus when making your own signature style statements as they fit your figure, not a High Street standard shape. Buy everything you need for the pattern at the same time; fabric, pattern, zip, buttons, interfacing etc – it’s all listed on the pattern envelope. what you’ve bought to sew. It always pays to use good quality thread as cheap threads split or break easily. Read ALL the instructions and look at the cutting layout BEFORE you make a start. It will give you an idea of how everything comes together. Take care cutting out – if you get that right, the rest will be a breeze. Make sure you follow the correct layout for the style you are making and the fabric width you are using. TOP TIP: Mark it with a star or outline so you don’t accidentally start following another layout. Make sure that you place the pieces as shown – with the grainlines on the patterns (straight line with arrow-head either end) parallel with the selvedge of the fabric. This is so important – if you don’t cut on the grain, it can cause seams to pucker, twist or ripple. 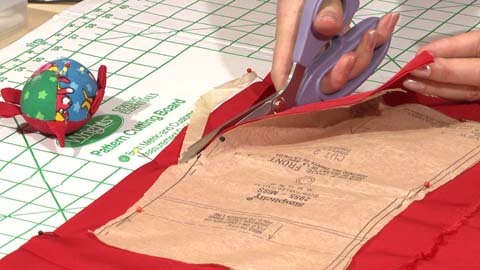 In the early stages, make sure you opt for a fabric that’s easy to sew. Woven fabrics like cottons, linen and linen like, polyester/cottons, gabardine, wools etc. are firm fabrics that are easy to handle. Avoid slippery silks and chiffons until you have completed a few ‘makes’ and you’re more confident. For more information, visit www.simplicitynewlook.com. Top tips for achieving a perfect fit. How to find and master a sewing machine.